Yes the Christmas books are arriving on bookshelves already! Dicken’s Square was built in 1950 as the central civic attraction of the newly incorporated Dicken’s Junction. It has a pedestrian areas lined with shops, a central fountain and a statue that was suppose to be Charles Dickens. It was later learned that Dickens hated memorials and wanted to be remembered for his work only so the statue was modified with an ability to change the head at different times of the year. Dickens novels were stories of social commentary. In a New York address, he expressed his belief that, “Virtue shows quite as well in rags and patches as she does in purple and fine linen“. * Dicken’s Junction was set to follow his beliefs especially those of a charitable nature. It is ten days before Christmas, the perfect time for a visit to this fine town as they have many events planned for the holiday season. Simon Alastair owns Pip’s Pages, a bookstore where he only stocks books he has read himself. A mysterious stranger comes in looking for a book by Ayn Rand which Simon quickly finds for him and then he learns the man represents Marley Enterprises. A company that wants to purchase all the square’s properties. Simon knows this means trouble but the man has left his store before he can get any details. When the man is later found murdered Simon knows he must investigate himself to get the whole story. A story that will lead him somewhere he doesn’t want to go. Ayn Rand’s beliefs and those of Charles Dickens could not be further apart. We are seeing this up close and personal now with the Presidential Campaigns today. Paul Ryan wants to emulate Ayn Rand on some of her principle beliefs while Barack Obama is more like Dickens. Rand opposes taxation as she considers it theft but she advocated the legalize abortion. Dickens brought us Scrooge, the rich capitalist and showed him how to be more charitable. Romney is like a modern day Scrooge without the later redemption, wanting to get rid of vital social programs. That makes this story a very timely read not only for the holiday season but as a look at these two very different schools of thought. Beyond the differing philosophies Lord has created a mystery much like Agatha Christie. His protagonist has the “aha moment” when all the clues fall together. He then calls a meeting of the interested parties to reveal the guilty party. The characters are interesting and diverse. The dialogue is sharp. The setting sounds like a wonderful place to visit. 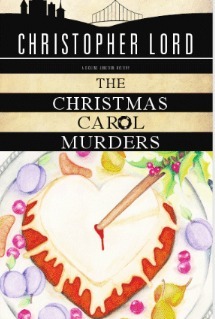 A little Dickens mixed with murder and mayhem. Let’s get the holiday started right. Christoper Lord was born in Astoria, Oregon. He now lives in Portland with his partner of twenty years and their Devon Rex, Miss Corey, the inspiration for Simon’s Miss Tox. He is hard at work on future books in the Dickens Junction mystery series. Check out his webpage here.